I started a new project on this website books: the key takeaway. The idea came from a post by James Altucher. He describes how difficult it is to remember more than 1% of a book and that a great book has one key takeaway that you remember afterwards. I read a lot and agree that it is hard to remember everything. Having one takeaway makes a book worth reading, so I decided to write mine down and share them. My process is as follows. I read a book and then wait a few weeks before I write my key takeaway down. Then, the one thing that I have thought most about in the previous weeks or the best thing I implemented in my life will be my key takeaway. While making the list I found that I gave quite a few 4 star reviews and not too many low scores. This is because before I read a book two things need to happen. First, either a friend or someone I respect (Ryan Holiday has an excellent reading list) must recommend a book. Secondly, the book needs to have good reviews on Amazon. When both boxes are ticked I will purchase the book. I found that it is easier to read a new book than to re-read a great book. However, there is more value in re-reading a great book to really make the concepts and knowledge your own. Reading a new book is more fun whereas re-reading a great book requires more effort. By writing down the key takeaway I remember and internalise the information better – using the power of repetition in a fun way. I will continue to update the list as I read more. Enjoy! The mixed martial arts multi-title champion Frank Shamrock has a system to train fighters. According to him you need a plus, a minus and an equal to become great. Plus: Work with someone who is better than you. Somebody who is at the cutting edge of development in the skill you want to improve. From them you learn. Minus: Find someone who is less skilled than you. You can teach them your new learned skills. The best way to learn is to teach it. Equals: Find someone who has the same qualities as you. Against this person you can push yourself to the limit. This system is not only used to train athletes, companies also use it. When I worked in in London there was an expert who taught me new skills, peers in my group who I could have discussions with and after a few months new colleagues who I could train. I find it a great, simple concept that I will apply to many areas of my life. Read more about Franck Shamrock’s system and the mindset necessary to succeed as a student in Ego Is the Enemy by Ryan Holiday. With every new skill you learn you go through four stages of learning before reaching mastery. 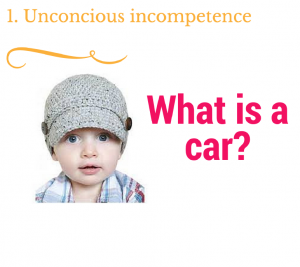 Going from incompetence to competence in a skill is often a slow and uncomfortable process. Understanding this theory will help you to deal better with the emotional ups and downs and helps you to guide others through their learning process. You don’t know what you don’t know. In other words, you might not be aware that you lack a certain skill. How do you open your blind spot? One way to find out what skill you need is to ask for feedback. The realization came that you are lacking a certain skill. This can be very frustrating. To advance through the learning process you need to study the subject and put your new learned skills into action. After studying and practicing you are somewhat decent at the skill. However it takes a lot of focus to execute the skill. At this stage a lot of people feel satisfied with the progress they made and the learning stops. That’s a shame. To reach mastery you need to keep practicing and learning. This is the holy grail of learning. Without thinking you can execute a skill that first required all your attention. You mastered the skill! Apply this framework to guide others through their learning process and to optimize your own. Motivation and momentum comes when there is progress in any area of our life. To achieve growth we have to put ourselves in the learning zone. 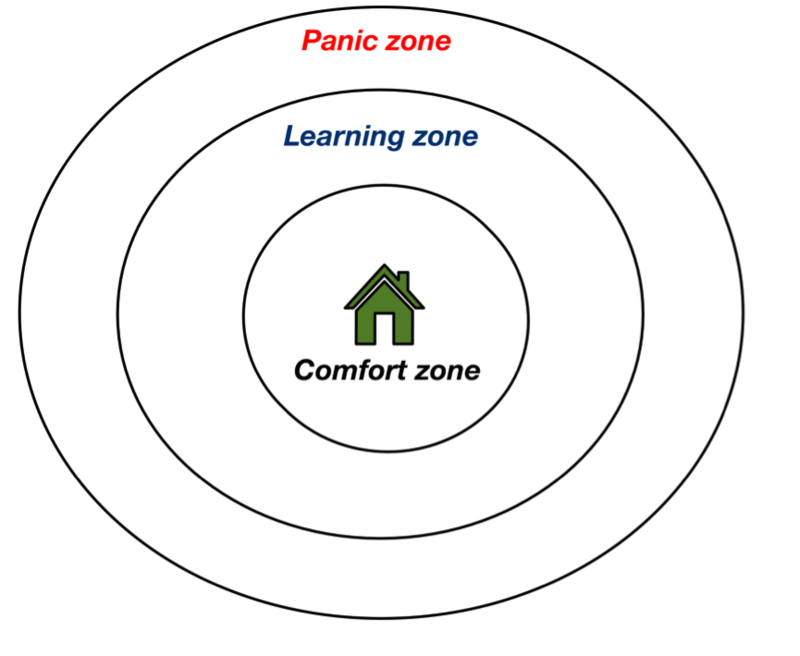 In any skill we practice we are in one of the three zones: the comfort zone, the learning zone or the panic zone. Comfort zone: This is our safe haven. We can’t make progress staying here since it consists of abilities we have already mastered. The comfort zone looks different for everyone. Some people find public speaking easy and within their comfort zone while it puts others into the panic zone. Learning zone: Here progress happens. The challenge we face requires new skills, but is not too difficult. Panic zone: Learning is impossible. The task is too difficult and makes you anxious. If you don’t make the progress you want the task is either too easy, keeping you in the comfort zone, or too difficult putting you in the panic zone. It is important to push yourself, but not to the extreme. And when you are in the learning zone your comfort zone will grow as a result. Are there any tasks you do without thinking about it that before would have stressed you out? Congratulations your comfort zone has grown. We all want to make progress fast. However, mastering a skill takes time and the learning process has many (emotional) ups and downs. For most of us becoming an expert takes at least 10.000 hours of practice. Many don’t reach that point; they become disillusioned and demotivated along the way. Luckily there is a simple model to help you. The inchworm concept helps you to acquire skills faster and more efficient. 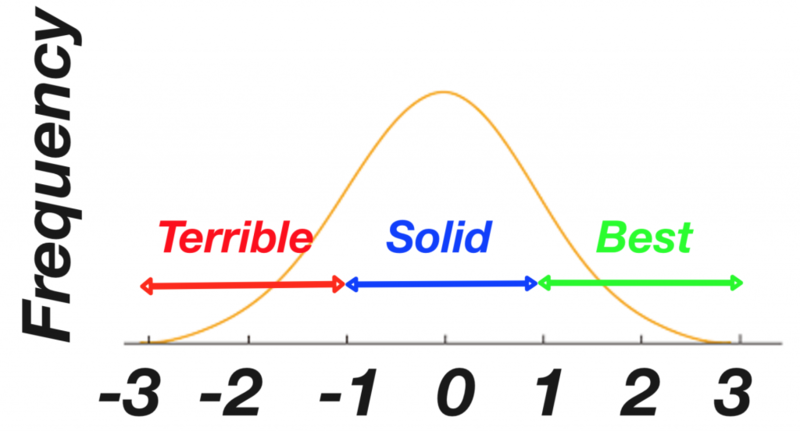 The result is a bell-curved graph where the right side represents your best decisions and the left side your worst. As you acquire new skills, in the learning zone, your best will get better: the graph stretches to the right. When you are fresh and well rested you make your best decisions putting the new skills acquired in step 1 to use. Unfortunately that does not happen very often since peak performance takes a lot of energy. To improve your skillset as a whole focus on fixing the terrible mistakes you make. As a result the left side of the graph steps forward. In combination with step 1 the whole graph has moved forward. This is very important. Imagine that in step 2 you did not focus on fixing your terrible mistakes. Instead you decided to add new skills again as you did in step 1. The graph would look very stretched to the right while the left side remains in the same position. At your best you are now even more amazing. However, when you perform solid or terrible you still make the same mistakes as before you learned the new skills. This is extremely frustrating. Making terrible mistakes while you can be great is highly demotivating. 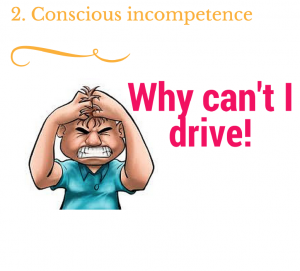 Luckily, in step 2 you improved your weakness before adding new skills following the philosophy of via negativa. With the whole graph having moved over to the right your mistakes will be smaller than before. This saves frustration, which frees up mental space making it easier to improve your best again as shown below in step 3. It can be tempting to only focus on improving your strengths; however improving your weakness will speed up your progress. This simple concept can be used as a framework to structure your learning. The experience is more pleasant making it more likely that you reach mastery. In the video below I explain the concept in more detail. As an avid reader of books and podcast subscriber, the consumption creation ratio was a real eye-opener. Consumption is easy, but consuming useful information is more difficult. Facebook, TV and the news are noise. Books, especially ones that stood the test of time, are signal. Consuming signal instead of noise is a great first step, but that alone is not enough. Information only becomes powerful when you use it. You already know all you need to know to succeed. You don’t need to learn anything more. If all we needed was more information, everyone with an Internet connection would live in a mansion, have abs of steel, and be blissfully happy. Darren Hardy, The Compound Effect. I find that consumption still has its place, but the quote drives the point home. Put knowledge into action before adding new books to the to-read list. Some ideas are to write a book or blog, teach, make a podcast or start a business. This realization helped me to overcome a great frustration. When I was reading book after book at a high pace I found myself forgetting sections. Applying the new knowledge helped me to internalize the information much better. I also found that starting projects without lots of research beforehand gives me a better understanding of the topic. It forces me to think creatively and come up with my own logic. In addition, having my own ideas helps me to get more out of books and podcasts because now it is easier to understand details and read between the lines. Decreasing input and increasing output is more difficult than the other way around, but I found it a lot more satisfying. Are you a consumer or creator? At university you get a textbook and a workbook. Don’t forget to use a workbook later in life.